ADC jacks are rated up to 2.4GHz and 20,000 mating cycles. Canare jacks are rated up to 3.0GHz and 30,000 mating cycles.Kings jacks are rated up to 3.3GHz and 30,000 mating cycles. Trompeter jacks are rated to exceed SMPTE 292M specifications and 30,000 mating cycles. When patched, these jacks route signals straight through, and any unused signal is terminated to a 75 ohm load. 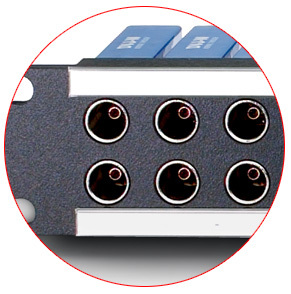 When unpatched, the rear source port is normalled to the rear destination port. When patched, these jacks route signals straight through with no termination of unused signals. When unpatched, the rear source port is normalled to the rear destination port. These jacks route signals straight through, with no normalling and no termination. When patched, these jacks route signals straight through. When unpatched, the rear port's BNC connection is terminated to a 75 ohm load.